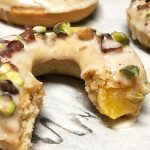 Bring the donut shop to your kitchen! I was craving a breakfast with peaches and cream flavor one week and bought some pre-made oats. It did not satisfy enough so I decided I had to make something. 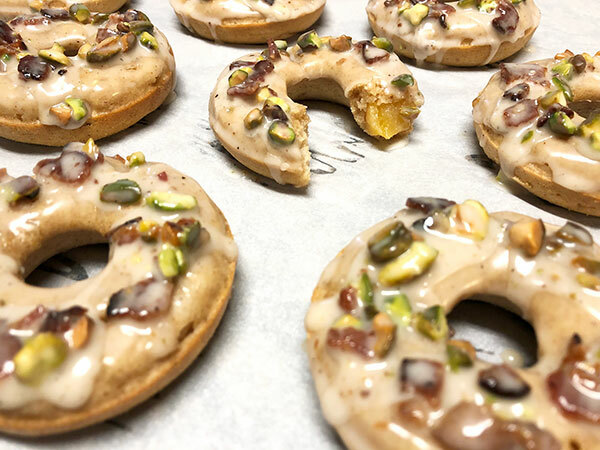 The weekend was coming around and I thought about how I hadn’t made donuts in a while… this would be a perfect opportunity to come up with a new recipe! 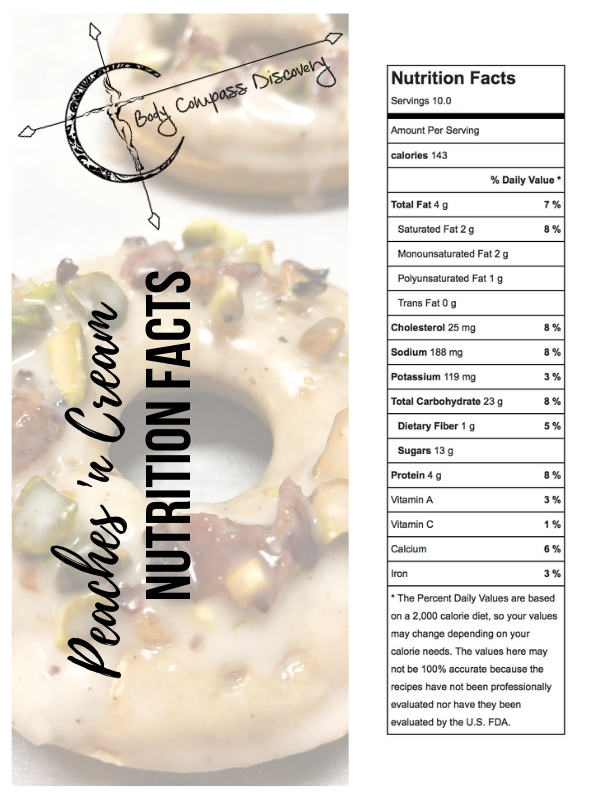 Why aren’t peaches and cream donuts more of a thing? If you can’t buy it, you can always make it! 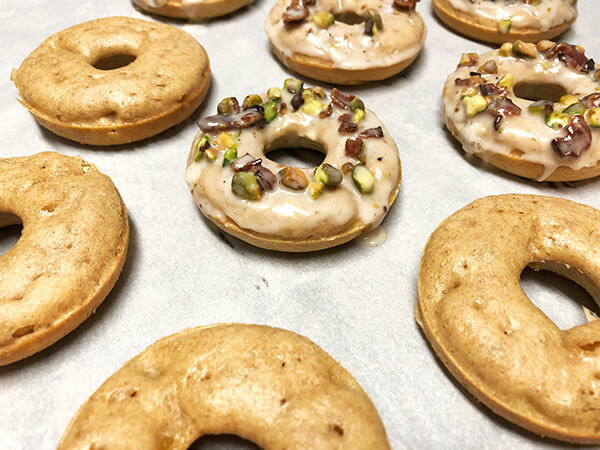 When I make homemade donuts I always do gluten free or whole wheat to keep them healthier, and definitely prefer to bake them! Start by combing the flour, sugar, baking powder and salt in a bowl. Add the egg, vanilla and melted butter to the bowl of wet ingredients. Stir in the dry ingredients and then add the diced peach. 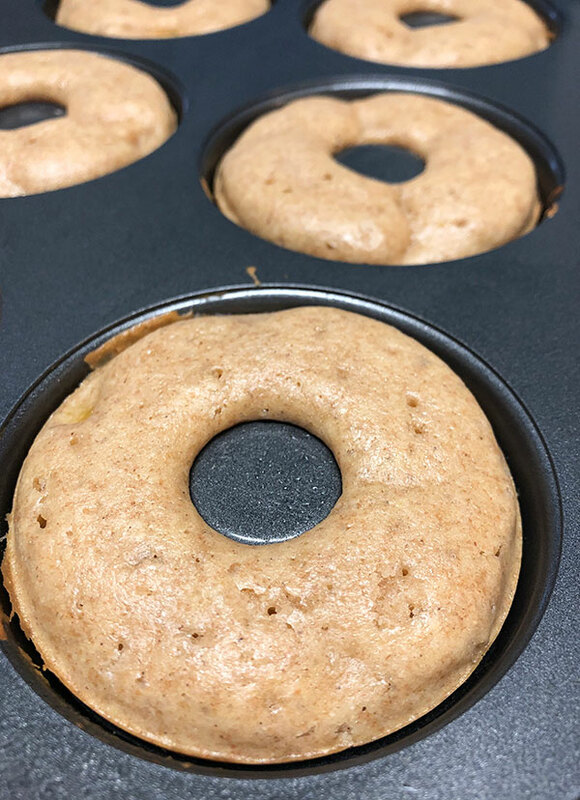 Pour the batter in to a greased donut pan and fill about 2/3 of the way. My donut pan only has space for 6 so I did this twice. I will say this is a messy process so make sure to clean up the pan after before placing in the oven, especially the center areas! Bake at 350F for 12 minutes. Remove when golden brown. Set aside to cool in pan, then twist them out and place on parchment paper. While your homemade peaches and cream donuts are baking I suggest cooking the bacon. Make it extra crispy so you can crumble the strips to small pieces! Make the glaze while the donuts cool by mixing 1/2 cup powdered sugar with 1/2 tsp vanilla and 1 tbsp milk. Mix together. Add more if necessary to reach desired consistency. Stir in the bacon crumbles and crushed pistachios. Dip the donuts one by one in to the glaze and then place on parchment paper to set. Drizzle a little extra glaze on the top of each if needed. Now enjoy! 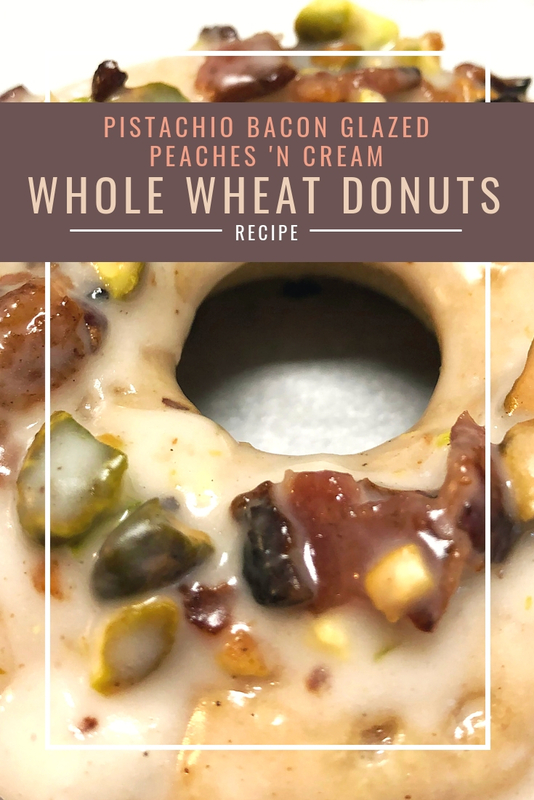 These peaches and cream donuts have a satisfying combination of sweet and salty with the fresh creamy fruit inside plus sweetened nutty bacon topping on the outside. 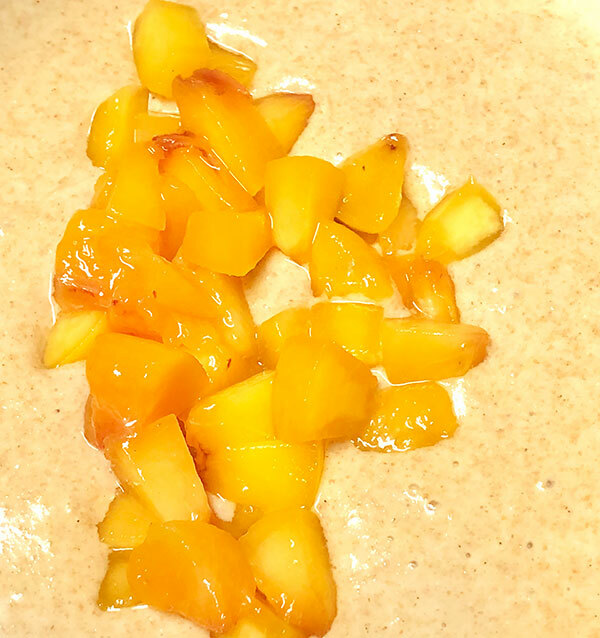 Mix the milk and apple cider vinegar in a small bowl and set aside. Dice the peach. Combine the flour, sugar, baking powder and salt in a bowl. Add the egg, vanilla and melted butter to the bowl of wet ingredients. Stir in the dry ingredients and then add the diced peach. 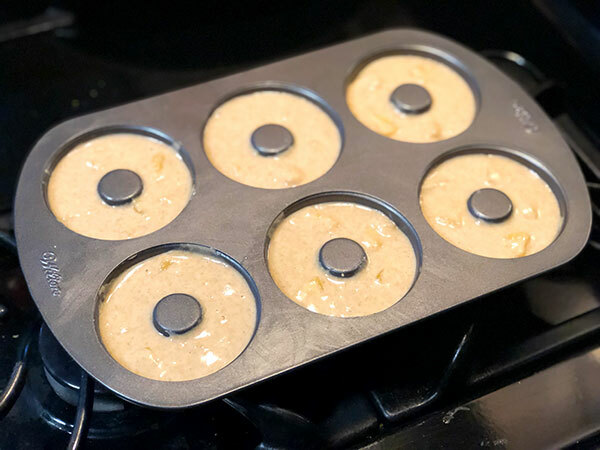 Pour the batter in to a greased donut pan and fill about 2/3 of the way. Bake at 350F for 12 minutes. Set aside to cool once done. Cook the bacon to extra crispy during this time. Make the glaze by mixing 1/2 cup powdered sugar with 1/2 tsp vanilla and 1 tbsp milk. Mix together. Add more if necessary to reach desired consistency. Stir in the bacon crumbles and crushed pistachios. 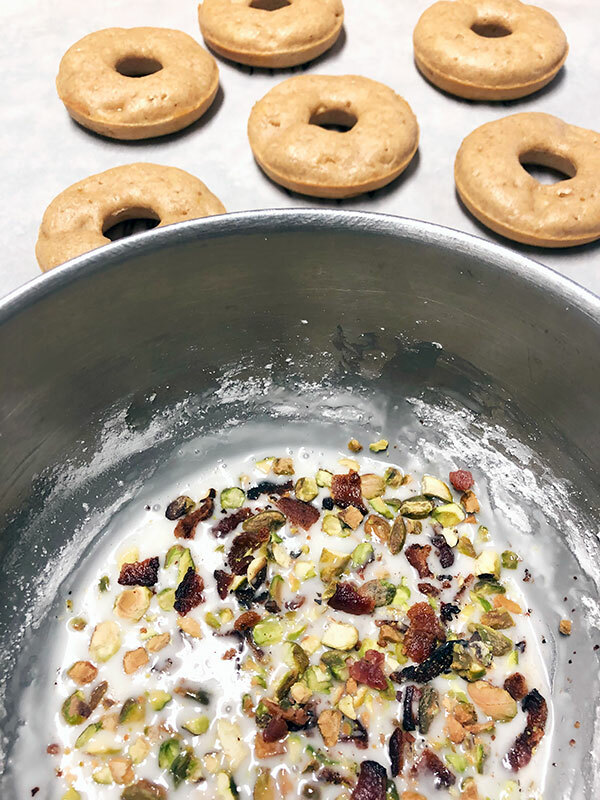 Dip the donuts one by one in to the glaze and then place on parchment paper to set. Drizzle a little extra glaze on the top of each if needed. Enjoy! For the glaze you will need an additional 1/2 tsp of vanilla and 1 tbsp of milk. These should not be glazed if you plan to store them in the fridge- keep separate until ready to eat. Definitely make note that these should not be glazed if you plan to store them in the fridge- keep separate until ready to eat! Otherwise the glaze will soak in and make them too moist. 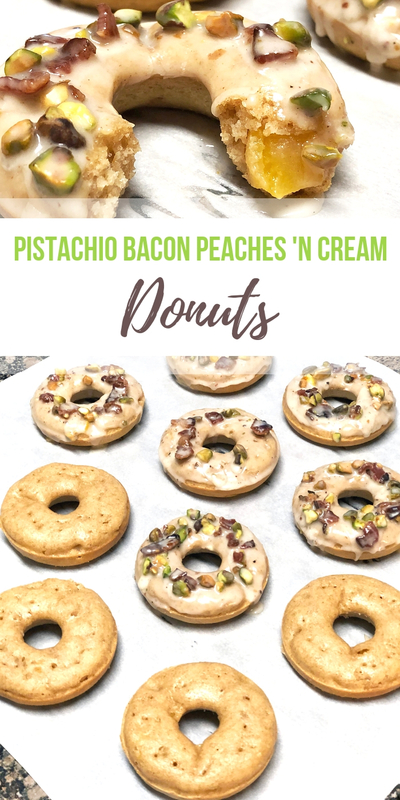 These whole wheat pistachio bacon glazed peaches and cream donuts are the perfect healthy alternative to a sweet breakfast craving! Indulge without all the extra calories- and in less time than it takes to go over to the donut shop! I can totally see these flavors balancing well with each other. What an interesting and unique recipe! Thank you so much!! It’s definitely one for your taste buds! I would never have thought of doughnuts for breakfast but now I’m thinking of nothing but. Peaches sounds delicious too. Thanks for the great recipe. Such a unique combo! Can we agree to put pistachios & bacon on everything?! Looks delish!